2. When you should lie low - During your Opposite sign - it's exactly six months from your birthday! 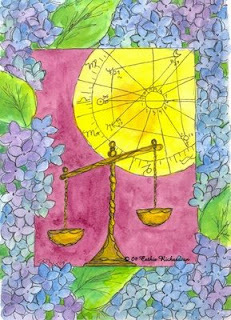 For Libra, that would be when the Sun is in Aries! 3. Follow the Sun. Every month, the Sun glides through each of the twelve Houses. Want to know yours? The Sun begins your year in Capricorn, your 4th House, then enters Aquarius, your 5th and so on. Saturn in Capricorn is your 4th House of motherhood, the past, your home/residence and family members. Issues from the deep past can also resurface now! 6.Where you experience the most expansion, luck and prosperity…Scorpio is your 2nd House of money, personal possessions, self-worth and real estate! Your 6th House of health, daily routines, repairs and maintenance and how you earn your money on a daily basis. This is also a placement for getting yourself looking your very best. You will want to exercise, eat more healthy and take better care of your health as well as those close to you who might not be. Your 4th House of home, residence, where you have lived, where you will live and where you live now. The 4th House also deals with motherhood, your roots, relatives and what home means to you, Libra! 10. When you can make a fresh start.........The New Moon in Libra (10/8/2018) and whenever the Sun transits your sign, Libra! 12. The signs of Gemini, Virgo and a Sagittarius are involved. These individuals have much to teach you, so listen and learn. An attraction escalates to the point of a possible marriage or children. You could also inspire another Libra in ways that will continue to remain silent.